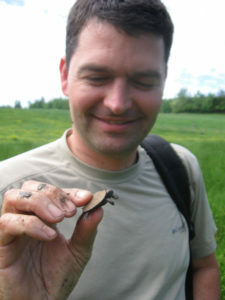 Bryan Stuart with a hatchling Bog Turtle (Glyptemys muhlenbergii) in western North Carolina. Photo by Jeff Beane. Bryan Stuart has a B.Sc. in Biology from Cornell University, an M.Sc. in Zoology from North Carolina State University, and a Ph.D. in Biology from the University of Illinois, and held a postdoc appointment at the Museum of Vertebrate Zoology, University of California, Berkeley, before returning to Raleigh to join the museum in September 2008. 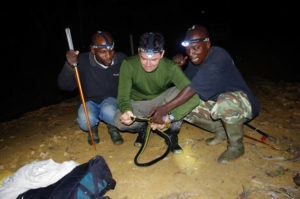 Bryan Stuart and national park rangers with a Jameson’s Mamba (Dendroaspis jamesoni) in Gabon. Photo by Rayna Bell. His research interests are in the biodiversity, systematics, biogeography and conservation of amphibians and reptiles, both in North Carolina and abroad. Much of his research has focused on amphibians and reptiles of the Old World tropics, especially in mainland Southeast Asia, where he has maintained an active field program for the past 19 years. 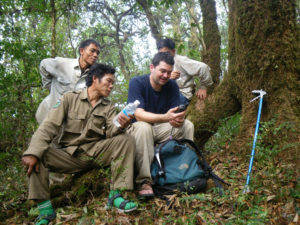 Bryan Stuart with local conservation managers in the field in Laos. Photo by Chris Hallam. He has particular interest in using molecular tools to define species boundaries and unravel their evolutionary histories. He is also deeply committed to capacity building and training of biodiversity scientists in the developing countries where he works. 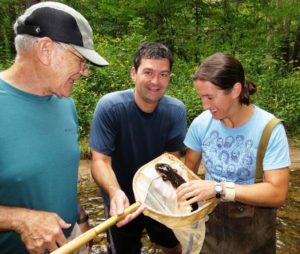 Bryan Stuart, Harold Voris and Jennifer Sheridan with a Hellbender (Cryptobranchus alleganiensis) in western North Carolina. Photo by Jeff Beane. His research and training programs have been funded by the U.S. National Science Foundation, the John D. and Catherine T. MacArthur Foundation, the National Geographic Society, and the Triangle Center for Evolutionary Medicine. 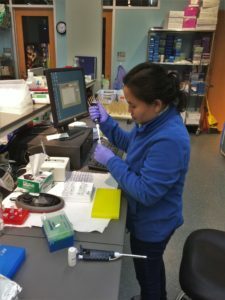 Dr. Somphouthone Phimmachak, Lecturer in Biology at the National University of Laos, working with Bryan Stuart in the Genomics Lab on DNA extractions of a new species of frog from Laos during November 2016. Her visit and training was supported by a Professional Development Grant from the World Wildlife Fund’s Russell E. Train Education for Nature Program. Photo by Bryan Stuart.